BEWARE! Long hair & garbage disposals don’t mix and can cause mishaps! I like to share information that can help others prevent mishaps from happening. We’ve all heard the saying, “It’s always better to be safe than sorry” and I find that to be so true. I’m usually a pretty cautious person. Sometimes to a fault. I have a friend who had a mishap that could easily have been prevented and luckily she wasn’t seriously injured. But it got me to thinking, this would be a good thing to share on my blog and FB to help others think about steps they could take before possibly doing the same thing. 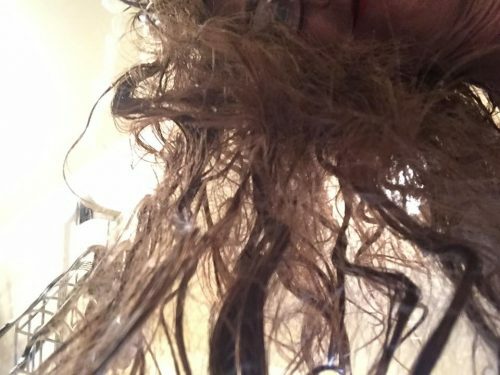 If you have long hair and decide to wash it in your kitchen sink where you have a garbage disposal, there are things you should do. This story is being shared with permission, name has been omitted to protect the innocent!. It’s so easy for accidents to happen. We highly suggest that if you have a garbage disposal and you have long hair that you do like to wash in the sink, get a strainer for your disposal so you don’t risk having this happen to you. Or use the strainer from the other side of the sink, if you have one. If you don’t have a strainer on each of your sinks, there are a lot of good reasons to get one. It’s always good to prevent the wrong things from going down your drain. I had a butter knife fall down a drain once. Never even dreamed that would happen. We see a lot of things accidentally dropped down a garbage disposal that cause damage to the item and the disposal. You just never know until it’s too late. And smaller items rarely stay in the trap under the drain when you’re running water, so you are very unlikely to get them back. Better to be safe than sorry!